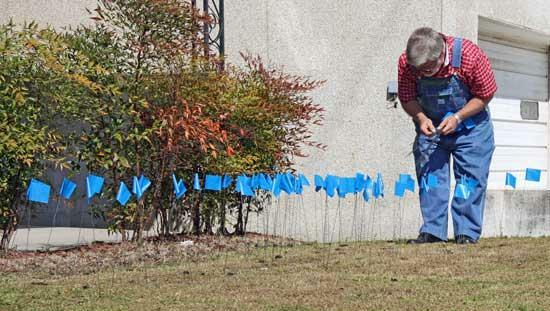 Why Are There Blue Ribbons On The Child Advocacy Center Lawn? As you drive past the Child Advocacy Center, located at 214 West Water Street, you will see blue ribbons on the front lawn. April is National Child Abuse Prevention month. The ribbons are in honor of child abuse victims. According to The Blue Ribbon Campaign, 3 children die as a result of child abuse in the United States every day. At least one of them is a baby - less than a year old. The other two children have not have celebrated their 5th birthdays. Every day, over 510 children are physically abused—slapped, hit, punched, burned. Over 270 children are sexually abused every day in America. This day is no different than any other day. Child abuse is an American epidemic. Children are harmed every day in our country. Cannon County is no different than anywhere else in the country. There have been 238 Cannon County children served by the Child Advocacy Center, 87 of which were served last year. The Cannon County Child Advocacy Center is a non-profit agency that serves child abuse, child sexual abuse, and drug endangered children. The Center staff work as a team with Department of Children’s Services, law enforcement, and the District Attorney’s Office to investigate and prosecute child abuse cases and help children and their families heal from the trauma and victimization of the abuse. The Cannon County “Andrea Walks for Tennessee’s Children” child abuse awareness walk is Friday, April 16 at 9:30 a.m., with the registration from 9:00-9:30 a.m. at Dillon Park. Contact the Cannon County Child Advocacy Center at 563-9915 to be a sponsor or for a Walk registration form. Join your friends and neighbors and walk to raise awareness about the serious issue of child abuse. With your support Cannon County will have the largest “Andrea Walks” in the state this spring! would it be child abuse if the mother of her child walked out on her husband and ten year old child at the time.... and wanta come in her life with money when the child is 21 now????? really..... the question is, that is not right... what does that do the the now a woman, child????? can u answer that one?